THIS PAGE OF THE WEB SITE IS STILL BEING "REMODELED"
On this page you'll find references to a variety of resources that have been found to be of interest and/or are pertinent to the information discussed on this site. In addition, many of the resources hold a special place in my heart for having been very important to my spiritual growth, and my own evolution. As always, discernment is a very-important part of life, and it is recommended that you exercise this inner tool in seeking the information that resonates as the Highest Truth - for you. “Heal Your Body”, by Louise L. Hay. Originally known as the “little blue book”, in this well-loved reference book for all, especially, those who are new to the concept that we can heal ourselves, Louise Hay assists us to understand mental causes for physical illness, and the metaphysical way to overcome them. Quoted, in part, from her “Dedication” page, she lets us also know, “There is no new knowledge. All is ancient and infinite." “Compatibility of Names”, by Pierre Le Rouzic. As a companion to “The Name Book”, this book is an additional relationship “tool” that can be helpful in understanding some extremely-subtle reasons we may be very drawn to someone and/or why some people simply do not resonate comfortably to us. “The Life You Were Born To Live; a Guide to Finding Your Life Purpose”, by Dan Millman. This wonderful book by the author of the Way of the Peaceful Warrior provides a particularly hands-on presentation on numerology. It is outstanding as a tool for working with a modern method, based on an ancient system, to help understand your past, clarify your present and empower your future. 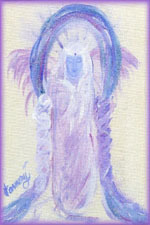 Channeled Angel and Guardian-Angel paintings, as well as books, by Gwen Mangum at Harmony Art. Here you can see Dolores, my Guardian Angel, which was channeled by Gwen. 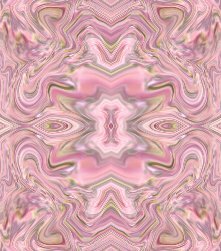 Many of Gwen's paintings and other art can be seen at: http://www.zazzle.com/harmonyart, and you can find out more about her books at: http://www.stores.lulu.com/wtgp. Setting Limits with Your Strong-Willed Child : Eliminating Conflict by Establishing Clear, Firm, and Respectful Boundaries by Robert J. MacKenzie Ed.D. Please keep checking this web site for future updates. Your interest is appreciated.